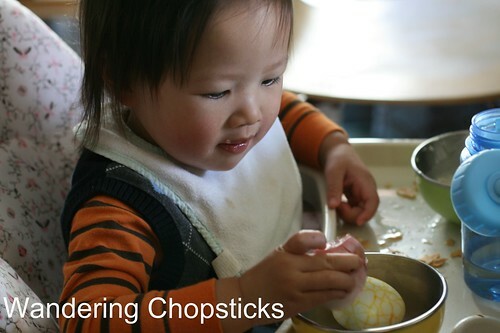 When my brother and I were little, our mom helped us make those shrink-wrapped images to wrap around eggs for Easter. She also hid chocolate eggs for us to find. I wonder where my mom got the idea? From the nuns who sponsored us? Or the parishioners who taught my mom and aunts how to make Christmas stockings? It's funny to think about it now, these little rituals introducing us to American pop culture. 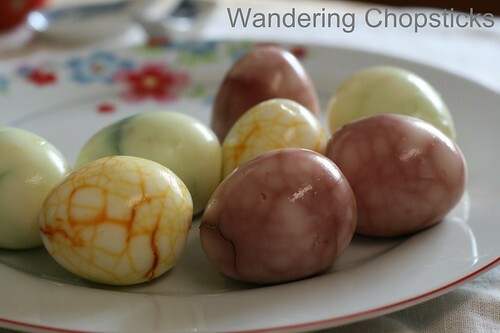 It's been years since I made eggs for Easter, but ever since I saw the colorful crackled eggs on Barefoot Kitchen Witch, I knew I wanted to dye them with vegetables for a more natural effect. Beets were an easy given. 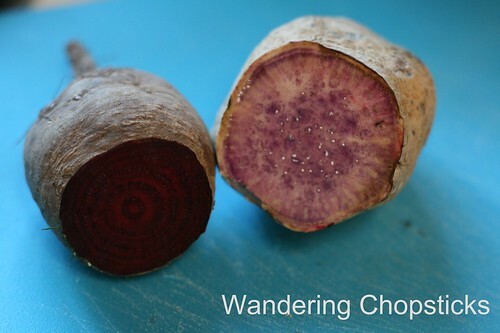 Remembering the vivid purple of my Mashed Okinawan Sweet Potatoes, I hoped for a similar result, but it was a rather disappointing light blue-green. I decided to use turmeric to add a third color into the mix, and that ended up being my favorite. My brother said they looked like dinosaur eggs. And I elicited "Ooohs" out of both Pablo and the niece when I peeled the eggs in front of them. Just a fun project to try without any artificial colorings. 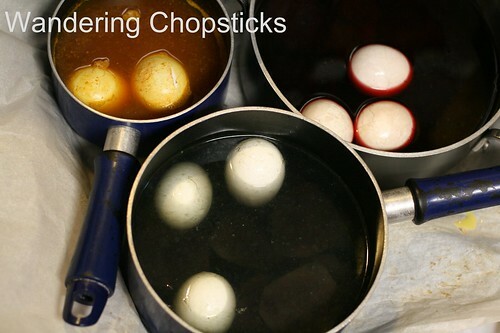 Boil as many hard-boiled eggs as you'd like and let it cool. Then lightly crack the shells all over. Why resort to fake colorings when mother nature has so many gorgeous hues? Peel and slice the beet and purple sweet potato. 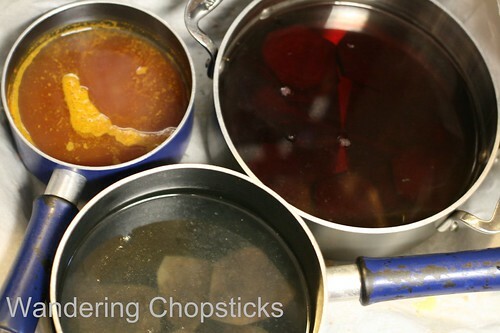 Fill three pots with about 2 quarts of water in each and set to boil. When the water boils, add the sliced beets to one, sliced purple sweet potatoes into another, and 1 tsp of turmeric into the third. Let the water simmer for about 5 minutes to release the colors. 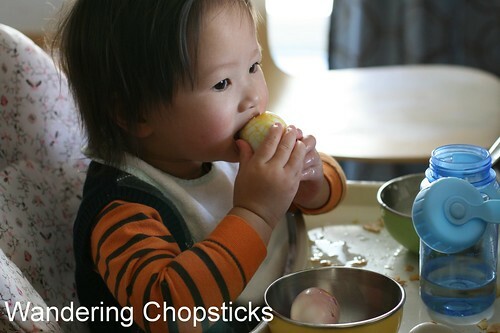 When the water is cool, add the hard-boiled eggs and put into the refrigerator overnight. The next day, peel the shells and see what you get. 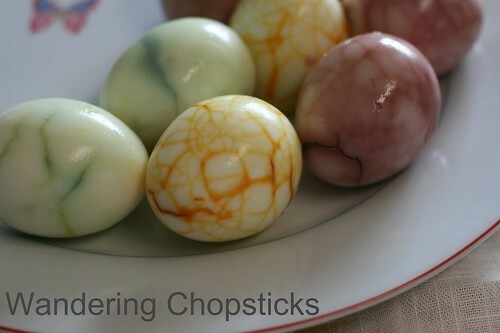 I'd have to say the turmeric-colored eggs are my favorite. 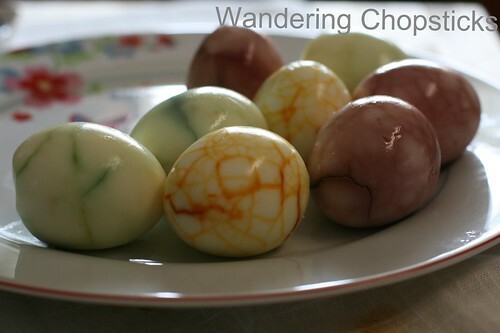 The eggs aren't in the vegetables and spice water long enough to absorb the flavors, just the color. 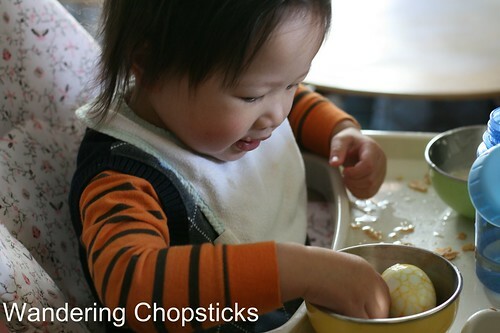 Watch as toddlers go "Ooh" and "Aah." The niece couldn't make up her mind which egg to try. So she ate a bit of both. 1 year ago today, Thirsty Lion Pub and Grill - Tigard - Oregon. what a lovely idea! 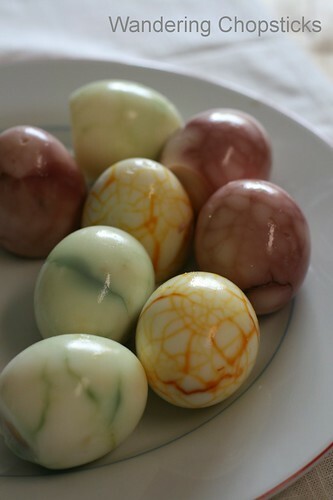 my mother used to dye eggs (non-crackled) with boiled onion skin (only works for white eggs). how cute! they really do resemble dinosaur eggs! That's so cool! All natural colours too. And your niece is so sweet. I've seen those too and recently saw really pretty ones done by pressing the flowers onto the shells first, and then wrapping them in pantyhose so the flower shapes are on the eggs.